Please note: This is not a WordPress plugin but it can be easily integrated. We provide a tutorial how to use it in WordPress. Please contact us via Email. This is our biggest release ever! We are sure you will be impressed again. ZOZO TABS 6.1 – jQuery Tabs Plugin comes with some awesome new features to the table including Flat Theme Pack Extension, enhanced core css and themes, more intelligent responsive feature. Latest version of Zozo Tabs is version 6.1 and supports jQuery 1.9.x, visit changelog to learn more. Once you have bought the product you have access to FREE updates. If you have any suggestions on how to improve Zozo Tabs, please let us know! We will seriously consider any suggestion and add it to the next update list. Tested and compatible with all major desktop browsers including IE7, IE8, IE9, IE10, Chrome, Firefox, Safari, Opera) and mobile browsers. We have tested it on iPad, iPhone (IOS), Samsung Galaxy S3, Samsung Note 2 (Android). Opera Mini and Chrome Mobile. Responsive fluid grid – very lightweight responsive fluid grid system included. Powerfull API – Zozo Tabs has a lot of public methods which you can use to control the tabs, view Public methods demo and callback events (select, deactivate, etc) view Callback events docs. No Programming Skills Required – It’s dead simple to install using jQuery selector like any other plugin, but also using HTML5 data attributes which means no coding required! 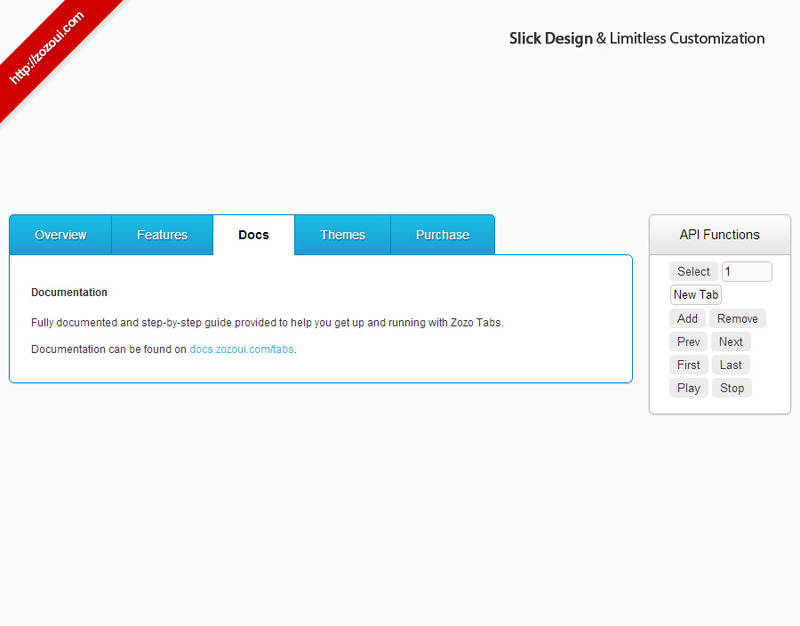 Event/Action – Zozo Tabs supports click/mousehover to select a tab. Steps and Wizard – Tabs can be disabled to use it like step or wizard. 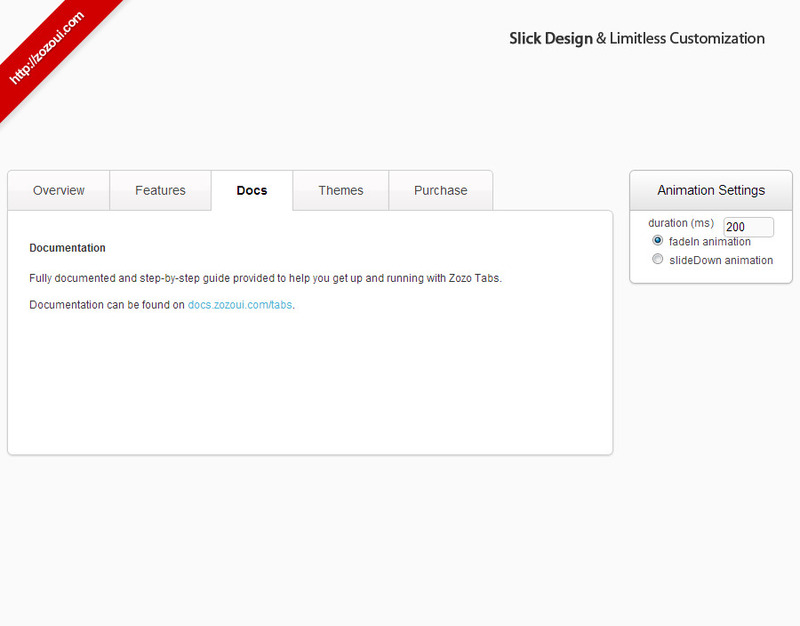 Flat Theme Pack Extension – in v.6.0 added 20 awesome flat themes, flat styles such as contained, clean, pills which can be combined with all themes in dark and light. External linking – You can put a external link or any type of link to each tab. Automatically Scrolling – When clicking on tabs/downlown menu on smaller screens, it will scroll automatically to show your content. 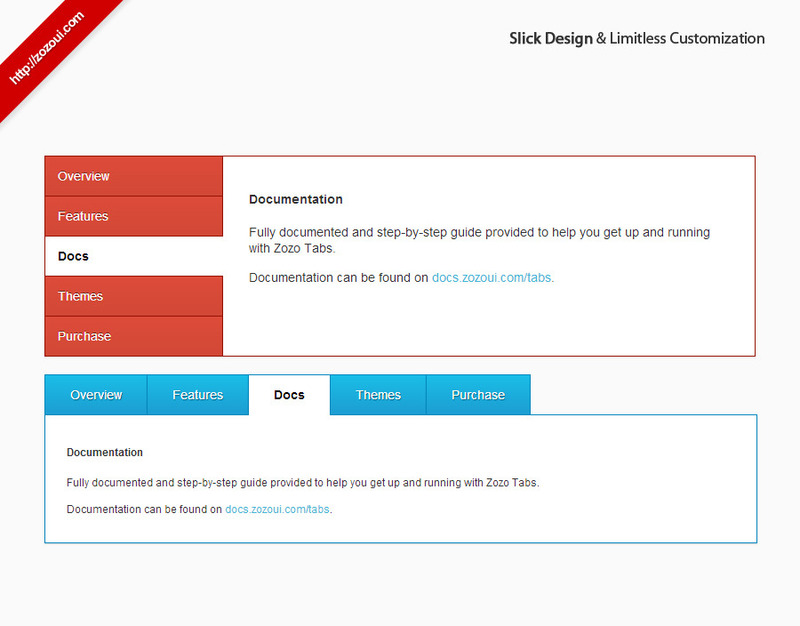 Free support and Updates - Zozo Tabs is now in its 3rd version, and each of these updates has been free. Zozo Tabs is always under development, frequently updated and continues to offer more features and improvments with each new release. Also allow developers and designers to create custom themes and customize your own build suited to your individual needs, modify, include or remove certain modules (reduce size of css by 90%) such as vertical, underlined, multiline, responsive etc. But for beginners and anyone new to CSS it is highly recommended to just start with the full package, without having to worry which modules are necessary. To start with customization read the README.txt file in the source folder and follow the instructions. Zozo Tabs is powered plunty of websites worldwide and the number is growing rapidly. Below you can check out few examples of what can be achieved with the help of Zozo Tabs and how it can be integrated within your blog/website. enochsystems.com – excellent example of using underlined tabs with custom api usage. kinderoos.com.au – great example of using vertical tabs on contact page. visibilitysoftware.com – example of using underlined tabs. golasvegas.co.uk – excellent example of using custom themes. lensbob.com – one to the best exampe of using of nested tabs on product page. alternativestoadsense.us/ – good example of using simple tabs on the home page. inkgarden.com – great example of using zozo tabs on the product category page. activemotorwerke.com.au – great example of dark theme on the home page. finanztreff.org – excellent example of using FontAwesome icons with zozo tabs. qasidonline.com – great example of using zozo accordion nested within zozo tabs. apartamentonerja.com – great example of loading content with ajax. rumble.com.au – great example of using flat custom themes on consulting page. opzionibinarie24.it – excellent example of using custom themes. singlepointoc.com – excellent example of using customized clean tabs. brep.co – good example of using silver theme and clean style. miserenatatango.com/ – excellent example of using icons and nested. barrowfunds.com – great example of using custom theme. applicantinsight.com – great example of using it home page with icons and hover effect. carmenguedez.com – good example of using underlined and nested tabs. sparks – great example of using it as a slider. newinfills.ca – good example of using default tabs. chileretirement.com – great example of using flat, nested and icons. University of Toronto – great example of using custom theme. siobhanpreston.com – excellent example of using vertical tabs on home page. jeremedowns.com – good example of using nested tabs. themeparkpress.com – good example of using zozo tabs to display books details. votegipe.com – great example of using white theme..
www.hasilkarya.com.my – good example of using zozo tags to display products. http://e-activist.com/ – great example of custom themes on compaigns page. I have! the clean tabs are awesome! 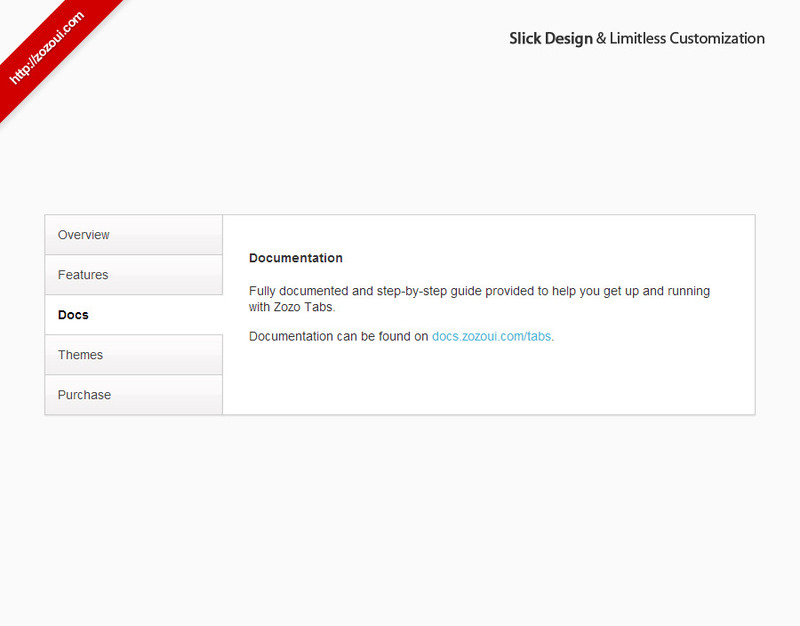 Fantastic product, incredible features, great documentation and responsive support. I highly recommend Zozo Tabs to anyone who needs a tab plugin, it’s probably last one you’ll ever buy Check out the superb demo on his site, tells you everything you need to know. ZoZo UI Tabs is a fabulous tool! The support was quick and the developer stayed with my correspondence until I completed the project. Fabulous tech support and a great developer! Thanks again ZoZo! A fantastic script that I’ve used a number of times in different situations. Support from the developer has been superb! I also want to express how grateful I feel about this tool. As a backend developer this is so precious for us to get professional results in frontend (it is a little painful for me to have to deal with css3, jquery, responsiveness, crossbrowsing, apart from backend tasks). I really encourage you to keep on with your developments and get a full ui plugins set with the same quality as this one. Excellent code. Very impressed with support, 5 stars! GREAT !!! I do not have superior design knowledge, so I misplaced some code. But after some really great and extremely fast support I got it working. 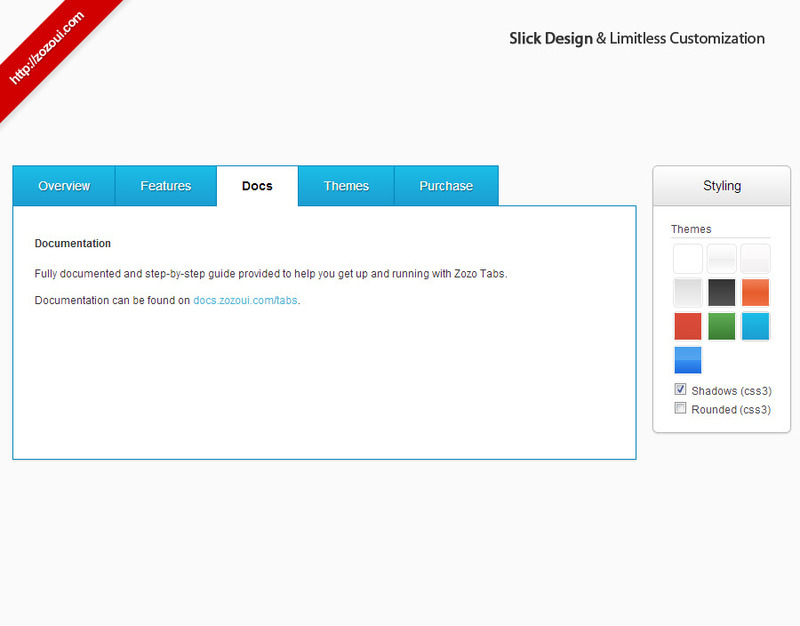 Even for customizing the tabs to my website design I got some questions and with support it all works perfect now. Had an issue with tabs caused by my own negligence, but the Zozo team responded promptly and had me back up and running in no time. Fantastic product, fantastic support. Nothing else to be said. 5 stars. I have installed Zozo Tabs plugin on my Wordpress site. Since I don`t have a deep knowledge about web techologies, I`ve hade some difficulties. But at Zozo, they have responded really quick. I was supriced. I give 5+ stars. Very good plugin and amazing support. 100% recommended. This is a great Tab solution. I’ve used other Tab methods including others on Codecanyon and this one is my favorite. If you get stuck on anything, the support is top notch. Fast, thorough and to the point. Don’t hesitate to purchase this one if you are choosing between others. I’ve heard rumors of a Wordpress plugin coming soon too. Very exciting! Unlike pretty much every other purchase I’ve made on CodeCanyon (and I’ve made some bad purchases), Zozo Tabs worked straight out of the box. Really impressed both by how it works and looks, as well as very clear documentation. Excellent job! If you’re upgrading from a previous version, please look at Important Upgrade Notes v.6.0 for a list of major changes that could affect your code. You also get free lifetime support and updates. If you have any questions, ideas or suggestions, please feel to contact us at support@zozoui.com. Sending an email to our support should include your envato username, detailed issue description and url of the page/blog. Please note: do not post support related questions here under the item comment section which is only for pre-sales questions and testimonials. If you enjoy this plugin please take a minute rate it & share it!. The majority of buyers rate it 5 stars if you are rating it with less than 5 stars please drop us a mail why it didn‘t achive a full score and what could be improved in your opinion.